You don't usually associate the word ‘desert’ with luxury, but this is exactly the feat which middle-eastern Dubai has managed in recent years. Thriving with a booming economy and surrounded by scorching dunes, the country is now synonymous with luxurious vacations - an escape from the monotone of conventional living into an exotic land of sand, decadent safaris, indulgent cuisine, scented spices, bustling markets, bejeweled islands and decked up malls. One can never have enough of Dubai, a country with its feet firmly planted in a glorious past and yet still looking forward to a modern future. However, even with very little time, you can easily find some genuine Dubai experiences and enjoy the region without missing out on the best activities it has to offer. Here is a quick rundown on the best way to spend 48 hours of luxury in Dubai and return home feeling rejuvenated. When in Dubai, a desert safari should be on the top of any to-do list. On a trip across the Dubai sands, you come across the heart of the country, its culture and history while also taking part in a number of exotic and adventurous experiences. A luxury desert safari will start off with an air conditioned car from your hotel and driving off into the horizon with the sands and relentless sun dominating the view. Your chauffeur and guide will recall fascinating tales along the way about the biodiversity and history of this great expanse which has influenced the course of Dubai’s history itself. A desert safari can never be complete without a ride on the ship of the desert and a trip to a camel farm deep within the interiors of the Dubai sands where you can watch these hardy mammals in their natural habitat before taking in the landscapes atop of one. Dune-bashing (off-roading) will be next on your list as you head further inside the desert for thrills and as the sun sets amidst the golden sands creating a riot of bright hues in the sky, you can head off to a campsite to watch colorful Tanoura folk dance and even receive exquisite henna patterns tattooed on your hands or legs. Expect relaxing evenings and candlelit dinners beneath the starry skies with the very best of Arabic cuisine, from hummus and lamb chops to marinated chicken and fine wine. As incredible belly dancers cavort around the campfire, you can recline with a traditional shisha (hookah) and enjoy the regal Arabic vibes. Yes, these six hours will be full of experiences you will not be forgetting any time soon. The Burj Khalifa is an iconic structure of Dubai which is famous for its 124th floor ‘At the top’ observation deck, where one can enjoy panoramic views of the Persian Gulf, the Dubai marina, the Palm Jumeirah, the Burj Al-Arab and the colorful milieu that is the fabled land of Dubai. The trip to the top itself is also a memorable experience, from a journey on the moving sidewalk that provides a multimedia presentation on the country’s history and legacy to the high speed elevator that gets you to the top of the building (it climbs at a whirling speed of more than 32 feet per second). Thus a trip to the top will not only give you the sought after feeling of being on the top of the world, but the journey itself will pack in a few thrills too. You simply cannot “overdo” the desert in Dubai. 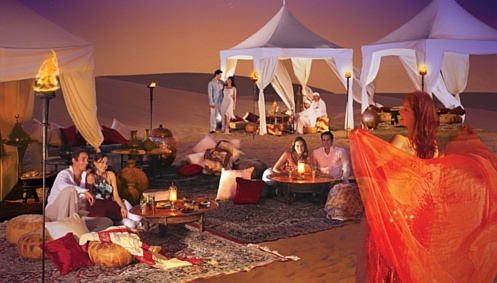 Thus, for your second night in the country, choose to dine under the starry skies again inside a tent fashioned in Bedouin customs on the grounds of a royal retreat. Take the opportunity to spot fauna in the region by driving through the Dubai Desert Conservation Reserve in a classic open-top land rover. Perhaps you can spot an Arabic gazelle tumbling in the sand while an Oryx looks on. As the sun sets coloring the surroundings in bright hues of orange and copper shades, look for an amazing falconry display in the skies, as the majestic birds swoop in. In the luxurious campsite, flaming torches, live dance shows and music creates a truly magical experience for indulging in a luxurious dinner spread. During the month of Ramadan, you can even break your fast with an Iftaar meal of dates, traditional cheese and other delicacies. After having a taste of the delectable Arabic cuisine, you can even choose to take a puff off a shisha, watch henna artists at work or simple stare at the stars above under the guidance of a resident astronomer. There is a reason why this water park was crowned “Best Water Park in Middle East 2015”. For a great day filled with exhilarating rides through shark infested shark tunnels, chutes down the mighty Tower of Neptune and Tower of Poseidon, you must head over to this Lost City themed water park that promises great times for adults and children alike. While you enjoy a plummeting fall into a double loop at Poseidon’s Revenge, little ones can chill out at the Splashers’ Play Area which is equipped with several fun activities like water fountains and giant water buckets to keep the kids occupied. If you want a break from the chills and the thrills, you can choose to relax on the Lazy Waters or head over to one of the restaurants for a bite. Alternatively, you can get an upgrade to include an entry to the Lost Chambers, a marvelous aquarium with sharks, rays and other mysteries from the depths of the ocean that has been fashioned after the legendary city of Atlantis. Dubai is a shoppers’ paradise. From quaint little shops in traditional souks where you can pick up spices, perfume, jewelry and local handicrafts to glitzy air conditioned malls that boast of stores from top labels like Chanel and Givenchy- Dubai is your happy place in case you are looking for the good old retail therapy. From the famous Dubai Mall, Mall of the Emirates, Ibbn Batuta, Dubai Marina Mall and Mercato Mall to the relatively new Wafi Mall, in Dubai you are spoilt for choice. Thus, raid the 96 malls in the metropolis in search of that perfect dress or suit and rest assured, this is one shopping trip you will not be forgetting. Dubai is a land of magic and luxury. Indulging in its experiences will not only refresh your body but also rejuvenate your soul. Visit Dubai for the taste of a luxury you have always wanted, in an exotic land of golden sands.